I’ve been on a cauliflower kick lately. It’s just such a versatile veggie…you can really eat it with anything! 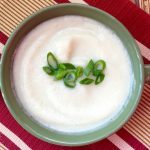 This 21 Day Fix cauliflower soup is pretty versatile, too…there are a couple of different ways you can make it to suit your tastes. If you want more robust flavors, roast the cauliflower and onion before blending (if you do this, be sure to add the olive oil you use for roasting into your container counts!). The flavor will be more complex, but be aware the soup will take on a darker brown color as a result. You could also experiment with different flavors of goat cheese (the herb goat cheese from Aldi is one of my favorites!). This quick and easy soup makes a nice, light appetizer or a filling lunch when paired with a salad (and that will get your greens in, too). This recipe freezes well. You could easily double this recipe (both stovetop and Instant Pot versions) and freeze the leftovers. Ingredients are the same, except use three cups chicken broth instead of four. You also won't need the 2 tablespoons of water. Prepare turkey bacon by your preferred method. Combine cauliflower, garlic, the white part of the green onions, dried parlsey, broth, sea salt and pepper in your Instant Pot. Lock the lid in place and turn the pressure valve to seal. Use the manual setting on high for 7 minutes. Once done, do a quick release and carefully remove the lid. Use an immersion blender to blend. You can also tranfer to a blender and blend that way, filling the blender up about halfway each time. Make sure the blender lid is adequately vented! Once blended, transfer to another pot (or back to the Instant Pot). Mix in the goat cheese until blended. You can may need to heat up the pot a bit to melt the goat cheese. Serve with remaining green onions as a garnish. Ingredients are the same, except use three cups chicken broth instead of four. You also won’t need the 2 tablespoons of water. Combine cauliflower, garlic, the white part of the green onions, dried parlsey, sea salt and chicken broth and pepper in your Instant Pot. Lock the lid in place and turn the pressure valve to seal. Use the manual setting on high for 7 minutes. Once done, do a quick release and carefully remove the lid. Use an immersion blender to blend. You can also tranfer to a blender and blend that way, filling the blender up about halfway each time. Make sure the blender lid is adequately vented! And while we’re talking about cauliflower…be sure to check out the posts below! The soup is very good. I made a booboo and used too much pepper. I added Worcestershire sauce to correct that. Please note that in the printable version of the recipe in step 3 you do not mention to put in the broth in the IP instructions and there is a typo of saly instead of salt.